Beautiful comfort items! Hope you stay safe and Sandy fizzles and doesn't pack much of a punch. Thanks for hosting! Your photos are so pretty - thanks for sharing. Sure hope Sandy fizzles out before landfall. :( Stay safe!! Thanks for hosting again this week with some many other things going on in your part of the country. Love the roses and they are very cozy feeling. We're west of Phila and have everything ready! 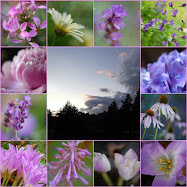 Your photos are lovely, amazing what layering can produce. I hope you will be safe, we in southern Ontario can expect the leftovers - still plenty of rain and wind I'm sure. These are gorgeous photos and mosaics! I do love the roses. I hope all will be well with you and all the folks in your area. I'm hoping the storm will head back out to sea before it does too much damage. Thank you for hosting Mosaic Monday and take care. 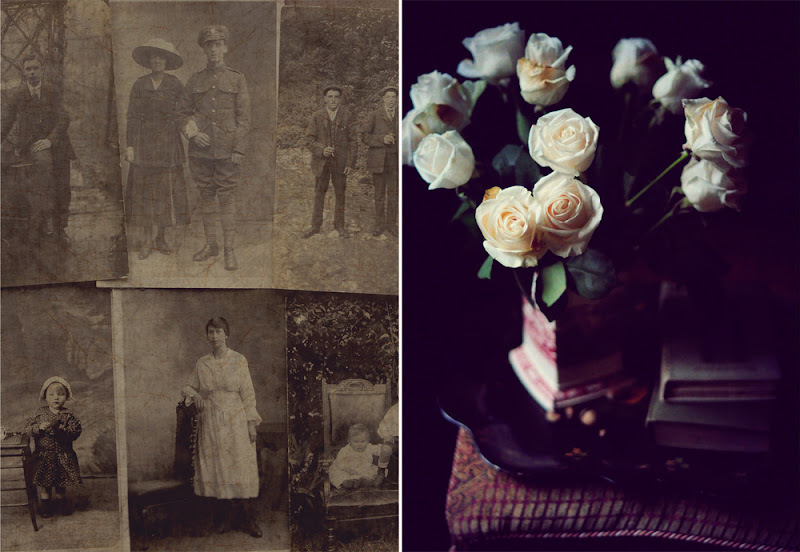 I love your vintage images and beautiful white roses! We are as prepared as possible to weather the hurricane -- hope not to flood or lose power. Stay safe and sound! Gorgeous combination of photos and roses! Beautiful images, and I hope you stay safe! You will be in my thoughts and prayers Mary! Stay safe, Mary. We're hunkering down for some heavy rain and winds here in SW Ontario too. 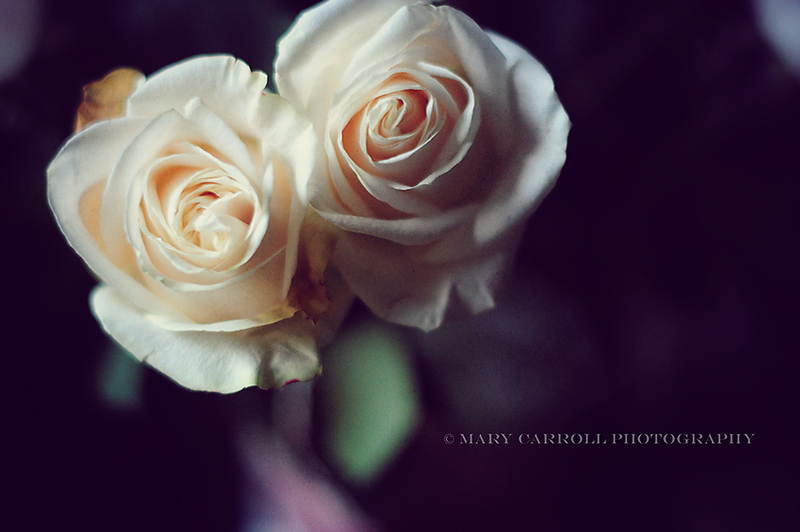 Such beautiful roses, so creamy against the dark background. I hope you will stay safe in the face of the hurricane. Prayers for all of you. 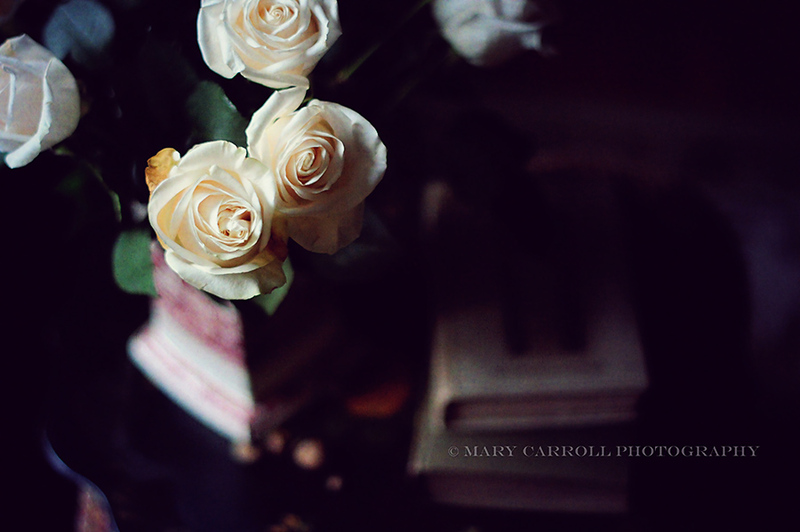 Lovely layers...roses and books have got to be more healthful comforts than chocolate and potato chips. Stay safe down there. I love the roses with the old photos! Great mosaics. Thank you for hosting and stay safe in the storm! Such pretty roses. I do hope that you are not in the immediate path of the storm. Stay safe. Be safe! Thinking of you and everyone in Sandy's path. Thank you for hosting the meme, as always, but especially in this weather. You mosaic is beautiful ... and yes, comforting. Hi Mary! I haven't joined in on a Mosaic Monday in ages! I'm glad to see you are still doing them. Your photos are so beautiful! Works of Art! I hope that you weather the storm safely. Please let us know and you will be in my prayers. Stay Safe! I'm enchanted with your wonderful old photographs - are the from the time of The First World War, I would dearly love to know more about them! That is a lovely cream rose and such a perfect bud. I've got several Iceberg roses but I would love the name of your cream one. Mary thank you for hosting Mosaic Monday. Please stay safe, we are hearing lots about the storm you're expected - even where I am far away in New Zealand. They roses are lovely. My thoughts are with you and all those in Sandy's pathway. Stay safe and dry. Your post is lovely. Please stay safe this week. We have family and friends back there (some who have evacuated) and we are praying for all of you. A prayer for your country. 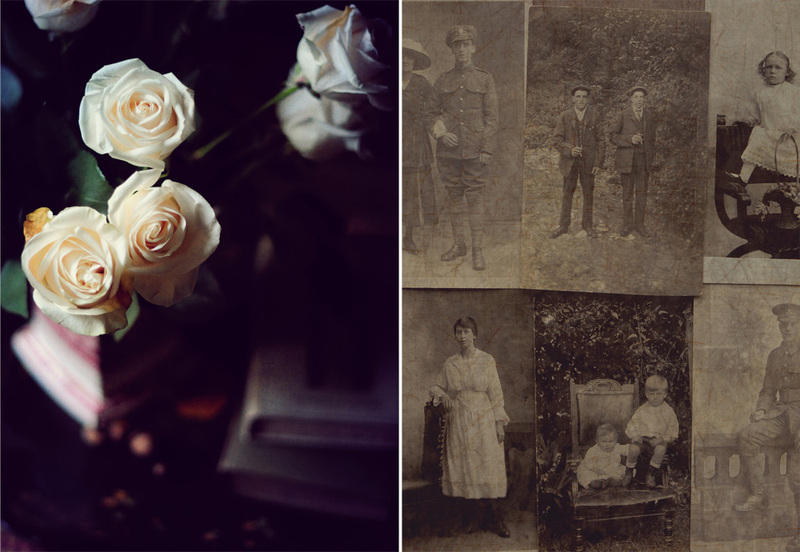 What a serene post...Roses and enchanting vintage photos! Lots of prayers coming you way as you wait out the storm. Thank you for hosting this lovely party each week...I love stopping by and joining in. Stay safe in your nest, Mary... Beautiful post today. Lovely post and welcome as I too wait for the storm of the century. My son in Santa Fe says, "Come to Santa Fe, we dont get hurricanes here." Hmmmm.....might consider that after all is done! Keep safe. Watching the news of the storm constantly. Love this post! Praying that you are all safe! Hi Mary, keep yourself safe. Thanks for hosting today. Thank you very mutch for the opportunity!! !I love your rhotos and I hope the Storm will pass!! Stay safe!! Be safe, dear friend! Prayers coming your way. Hoping you are safe, warm and well! Keeping you in prayer. Thx for hosting. Oh, Mary, I pray you're safe. I'm sending my prayers. Looking forward to hearing from you to see how you and your family are! You still are such a wonderful photographer. I am so sorry to know you are going through all of this! I am so thanksful you are SAFE, though. Keeping you all in my prayers! Thank you for hosting, esp with no power, what dedication! You are appreciated very much!